TOURISTS MAROONED ON Thai islands hunkered down today as Tropical Storm Pabuk struck the kingdom, forcing airports and ferries to close and bringing power blackouts, heavy rains and massive sea swells. 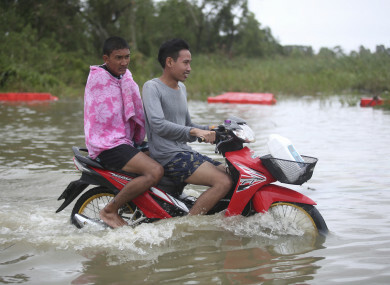 Meteorologists said Pabuk, the first tropical storm in decades to strike during the peak holiday season, made landfall in southern Thailand this afternoon. The eye of the storm passed over Nakhon Si Thammarat, sparing the tourist islands to the north from a direct hit. It caused a power blackout across swathes of Nakhon Si Thammarat and Surat Thani provinces, authorities said, as electricity poles toppled over in high winds and power lines were cut by falling trees. Earlier as it churned through the Gulf of Thailand, Pabuk stirred huge waves up to five metres high. A fisherman in Pattani province, near the Malaysia border, died after waves smashed into his boat before dawn as it returned to dock. Another crew member is missing. By late afternoon Pabuk – which means giant catfish in Lao – began to edge across the narrow neck of land between the Gulf of Thailand and into the Andaman Sea, home to the tourist resorts of Phuket and the Similan National Park, a diving paradise. “I’ve finished buying supplies… there’s no gas anywhere on the island, 7/11 is already running out of things,” a Spanish dive instructor told AFP. Holidaymakers on Koh Samui, whose airport was shut all day today, shared videos on Twitter of waves licking the steps to beachside bungalows as the wind speeds picked up. Email “10,000 tourists stranded as tropical storm wreaks havoc in Thailand”. Feedback on “10,000 tourists stranded as tropical storm wreaks havoc in Thailand”.